Spring is just a week away and if you’re anything like us, you’ve started to put together a spring cleaning list. If you want to ensure you stay cool through the spring and summer, it’s important that you include your HVAC system in your cleaning ritual. When you add these cleaning tasks to your list, you’ll see the benefits for months to come. If you’re in need of HVAC service in Las Vegas, call Tippetts Mechanical. Our HVAC gurus will ensure your system is ready to take on the oncoming higher temperatures. Dirt and dust attach itself to your return air vents when air passes through the HVAC system. This ends up clogging your air filters and causes your system to work harder than it needs to, which will reduce its lifespan. Most return air vents can be easily removed for cleaning, though you can leave them installed if need be. We recommend a two-step plan of attack for cleaning return air vents. First, vacuum off any loose debris that has settled. Once that is clear, wrap a butter knife with a rag and get in between the slats of the vent to clean the hard to reach areas. When you think about all the dirt and hair you vacuum off the floor, imagine how much is getting missed or knocked into the floor registers. While you should vacuum them regularly, it’s a good idea to get a bit deeper when you are going through spring cleaning. To begin, remove the vent from the floor. Some floor registers may need to be unscrewed to remove them. Place the vent in warm soapy water and either brush or sponge it clean to remove dirt and rust on the cover and within the vent. While you let the vent dry, vacuum the duct that the vent was on to clear out any debris you can. Once the vent is thoroughly dry you can reinstall it. Exterior condenser units can come into contact with a lot of debris over the course of the winter. If this debris isn’t removed, airflow will be restricted, and your system won’t be able to keep your home at a comfortable temperature. First, turn off the power to the condenser using either the outdoor shutoff switch or your home’s electrical panel. Using the soft brush attachment, vacuum the fins carefully — they’re incredibly delicate and can bend easily. Clear out any yard waste and cut down vegetation that may be growing around the unit to prevent any airflow issues. While this isn’t directly connected to your HVAC system itself, the effect it has on how it operates can’t be understated. If you’ve been enjoying natural breezes from open windows, you’ll accumulate dust, dirt, and other allergens that need to be cleaned away. When they build up, they’re blown into the air, which tanks your overall indoor air quality. Dusting and mopping clear your home of these airborne particles, which keeps your air filter clean, your system working optimally, and your home comfortable. We’ve brought up a few times how a clogged air filter can affect your HVAC system, so you should know by now that this is a good time to clean or change your air filter. Depending on your system, the type of filter you’re using, and the manufacturer’s recommendations, you may need to do this every month to half a year. If your air filter is in a tough to reach spot, an HVAC professional will be able to help you replace it. Now that you’ve gotten all of that out of the way, it’s time to let the pros do what they do best. Hiring a professional to clean your HVAC system will ensure it works properly through the spring and summer. They will also be able to diagnose any possible problems that may come up in the near future. Making air conditioner maintenance a part of your spring cleaning list will help prevent a costly breakdown in the middle of a hot summer day. Professional duct cleaning will keep the air in your home fresh and allergen-free. 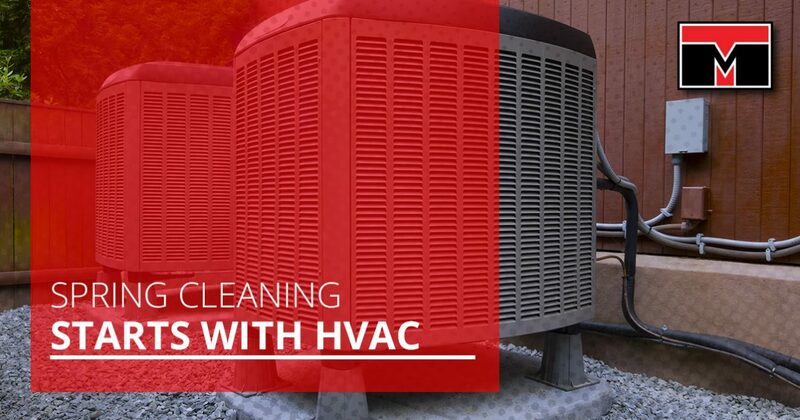 An HVAC professional will also clean the air conditioner coil, which allows it to improve system performance and proper heat exchanging. Including your HVAC system in your spring cleaning will save you money and stress while the temperatures rise. With how hot it gets here in Las Vegas, it’s important to have a working air conditioner. Whether you need HVAC service, a routine cleaning, or an upgraded unit, Tippetts Mechanical are your HVAC gurus. Call us today to learn about our service agreements to ensure your HVAC system is operating at peak performance year round. We hope to hear from you soon!